A small apartment bedroom presents unique challenges that can become great design solutions. Some design elements include the use of mirrors, wallpaper, patterns, colors and furniture. Make sure you clear any permanent changes, such as paint and built-in units, with management prior to making them. Paint, wallpaper or a stencil can instantly create an accent wall. Select the wall where the headboard rests. A solid wall gives you the best results. You can use a simply technique of going with the same paint color, only two or three values darker. This will provide a nice depth of color. A light hue for the main wall color is best to give the illusion of a bigger space. Use a complementary color or a contrast color for an accent wall. Paint the woodwork the same color as the wall to open the space and give the feeling of taller walls. Don't be timid and go with a tiny pattern. Trying to stay in a small size won't give you a comfy nice design. Be bold. Choose a larger pattern that will transform a small bedroom design into a sophisticated one. You can use either a large area rug that covers most of the floor space or you may decide to use a pair of smaller rugs placed on either side of the bed to break up the floor space. You have options other than a sofa bed when it comes to a bed. These won't take up the entire room space or create an over-crowded feeling. 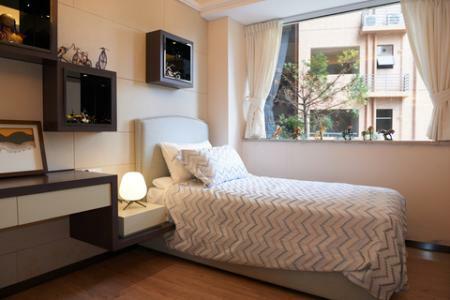 A popular choice for small bedrooms is a Murphy bed. These come in all sizes and cabinet styles. Some feature a desk when the bed is closed in the cabinet while others have a loveseat or sofa. Choose the size and style you like most. An obvious choice for some apartment dwellers is the versatile futon. This can be a sofa by day and a bed by night. These are available in twin, full and queen sizes. Some even feature a spring mattress like the one you'd use on a frame bed. Another way to decorate a small bedroom is to use a daybed. The range of styles include subtle low-profile and streamlined designs to substantial daybeds with pull-out trundle beds. A daybed can be placed along the width of a small bedroom to allow more floor space. Place a daybed underneath a window for a cozy nook appeal. Set a sofa styled day bed along the length of the room to create a home study or private sitting room. There are several choices of loft bed designs. A loft bed with a desk system underneath is a great space saver. The obvious choice for a small bedroom is a twin bed for a child and a twin XL for a teen. Avoid the natural tendency to scale down furniture sizes for a small bedroom design. Keep your design interesting with a mix of furniture sizes. Choose a cozy chair to set in one end of the bedroom. If you only have room for a small wooden chair, add a thick tufted cushion to go with your color scheme. Place a lumbar pillow on the chair. A clever way to save on valuable floor space is to use wall-mounted nightstands, shelves and even a desk. Place a wall-mounted nightstand on either side of the bed. Wall shelves placed over the bed can feature recessed lights. Shelves mounted one to two feet from the ceiling offer excellent options for basket storage and decorative objects. Wall-mounted desks can be stationary or fold into a self-cabinet. Use with a folding chair that can be easily stored. Lighting is another way to make smaller spaces appear larger. Use wall sconces or lamps over nightstands. Recessed ceiling lights on a dimmer switch provide ambient lighting. Mini-crystal chandeliers over nightstands add sparkling reflective lighting. Rope lighting installed along the crown molding reflects light onto the ceiling. 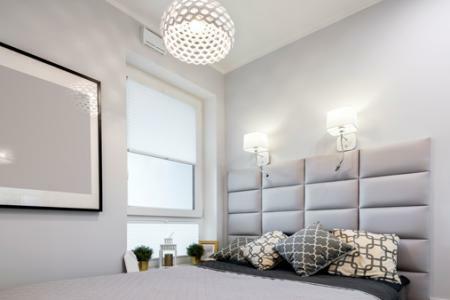 Reflective surfaces add light and create the look of a bigger bedroom. A tall floor or wall mirror creates the illusion of a larger space. A mirrored dresser and/or nightstand reflects more light into the bedroom. Use minimal window treatments, such as a valance and blinds. You may prefer decorative shades to add a touch of color and pattern. Layer a small bedroom with colors, patterns and textures for design interest and greater depth. Wall art can repeat colors, shapes and even patterns. Decorative throw pillows provide textured layers. A dresser painted or stenciled creates a focal piece or adds a pop of color. Small bedrooms can be transformed into restive havens. You can create a wonderful bedroom design for any small bedroom when you follow these guidelines.